Who doesn’t enjoy a pot of their favourite tea or coffee when relaxing on a lazy Sunday morning? With the use of a tea or coffee cosy, you can keep your drink hotter for longer. Here at Dexam you can finds a cosy for all sizes and in a selection of colours and fun prints, you can add some colour and character to your coffee break. 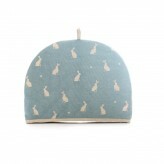 With a range of different patterned and style tea cosies to suit any kitchen, shop our range here.